SIX Michelle Exhibition ice skating pictures here! More Michelle Kwan, 1000+ figure skating photos! Figure skating competition photos were taken on Fuji 800 film with a 100-210 lens, 2.8 aperture, in a lit skating rink. My tickets were for Boston Fleet Center seats in the 12th row side and 10th row end. Because scanner has a problem with magenta, photographer has color-corrected some of the photos to decrease magenta, but yellowish-green cast has resulted on some scans. Michelle Kwan was born in Torrance California on July 7, 1980, and began ice skating when she was five years old, winning her first figure skating competition at age 7. 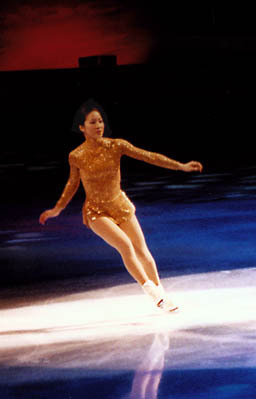 As of 2005, she has won 42 figure skating championships, including five World Championships, and eight U.S. Nationals Skating Championships. Her long run of both US and World championships have both broken figure skating records. In 1998, Michelle Kwan won the silver medal at the winter Olympics, and in 2002, the bronze. 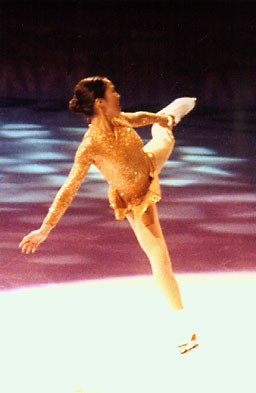 Due to injury, Michelle did not compete in major figure skating competitions during the 2005-2006 season, and was forced to withdraw from the 2006 winter Olympics. She did, however, win U.S. Nationals in 2005, as well as the 2005 Marshalls Figure Skating Challenge (fan vote), and placed 4th at Worlds in 2005. For many years Michelle was coached by Frank Carroll, but now is coached by Rafael Arutunian; her choreographer is Tatiana Tarasova. Her most recent programs in 2004-2006 include Totentanz, Rachmaninoff's Prelude in C Sharp Minor, Spartacus (Adagio), and Ravel's Bolero. Michelle skates with the Tom Campbell's Champions on Ice skating show which tours the U.S. April-July each year. Michelle Kwan and Sasha Cohen are two of the feature skaters in an all-star cast. I highly recommend purchasing tickets to the Champions on Ice shows (via the Champions on Ice website or directly through Ticketmaster) as soon as they go on sale, usually in January each year. Sitting close to the ice while watching dozens of the top U.S. and worlds figure skating champions skate - especially Michelle Kwan and Sasha Cohen - is a not-to-be-missed experience.